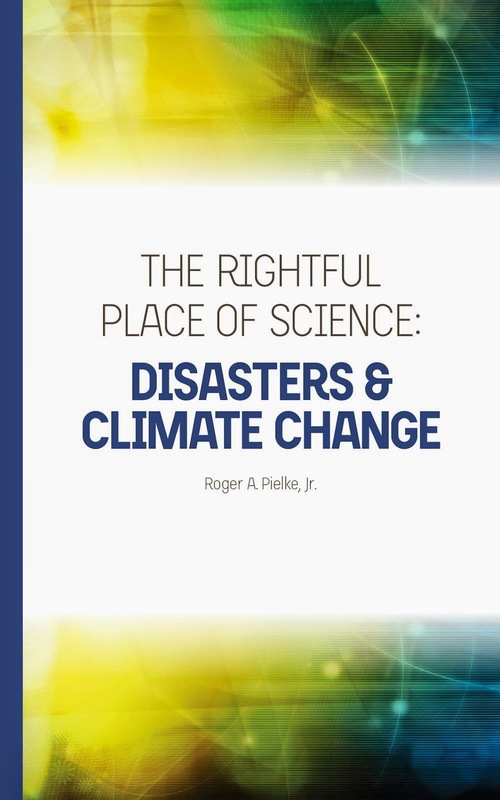 Roger Pielke Jr.'s Blog: Running Updates on the "Witch Hunt"
This post will serve as a running update on the so-called "investigation" of my research on disasters and climate change at the University of Colorado. I will update it as warranted, with newer stuff at the top. Pointers and tips welcome in the comments. 5 March - I'm moving on with my life, hope you are too! If there is anything really significant to add to the updates below, I'll do so, but meantime, I'm going back to writing my book. The lead editorial in Nature this week is about what they call a "fishing expedition" by Rep. Grijalva, saying that his actions send "a chilling message to all academics and to the wider public." Well said. Just yesterday, my 2013 Senate testimony that prompted Rep. Grijalva's attack was cited in a Senate hearing. Senator Jeff Sessions asked EPA administrator Gina McCarthy about trends in drought and hurricanes, citing my earlier testimony before that committee. On hurricanes McCarthy responded, "I cannot answer that question. It's a very complicated issue." The answer is of course "They have decreased in frequency and intensity by 20% since 1900." So long as Democrats find it impossible to hear what the data say on extreme events, the topic will remain deeply politicized. (The same is true for Republicans on other issues, hence the pathologically politicized climate issue.) I missed all the mainstream media coverage of McCarthy's struggles with the science. In the WSJ, Richard Lindzen of MIT, and another target of Rep. Grijalva, has a hard hitting op-ed in which he discusses the "witch hunt" and connects it to the overall political battle over climate policy and climate science. At Science Insider, a blog by Science magazine, I am interviewed by Eli Kintisch (@elikint) about COI, the "witch hunt" (my words) and my Ferrari, with plates that read "KochBros." The American Geophysical Union has reversed course, after first offering support to Representative Grijalva's "investigation." The AGU now says "The rules of transparency affect us all equally, and therefore must be applied equally." Better late than never, I suppose. I just did an interview with AM630 KHOW in Denver with Mandy Connell. We discussed science and politics, and it was another good conversation. You can listen to it below, starting at 72:40. The Boulder Daily Camera has a new article up, noting Rep. Grivalja has admitted to "overreach" but hasn't modified his request to my university. The University of Colorado states that it will be responsive to the request. I also am quoted in the article. I just did a lengthy, and I think pretty substantive, interview with Garret Lewis at KNST in Tuscon (in Rep. Grijalva's district). We discussed the "investigation," Al Gore, a carbon tax and other things. Lewis was well informed. You can listen to it below. Rep. Grivalja has walked back his requests, according to Ben Geman at the National Journal: Climate Letters Went Too Far. Since Rep. Grivalja already has complete access to all my financial COI disclosures, I guess we now know that the letter was an unnecessary stunt designed to smear. Nice. The Denver Post (March 3) has an editorial titled "CU rightly defends Roger Pielke Jr. against political bully" -- key quote: Rep. Grijalva's "gambit amounts to a bold, abusive assault on academic freedom." Mark Steyn asks why no reporters appear to be interested in the fact that an anonymous person had forewarning of Rep. Grivalja's "investigation" and used a fake email account from a Russian server to taunt those who would later receive letters from the Congressman. Bizarre to be sure, and if I hadn't seen the taunting email in advance I might not have believed it. But as I've said, nothing surprises me in the climate debate anymore. To believe that Rep. Grijalva's "investigation" has merit, you have to believe either (a) in a shadowy conspiracy of fossil fuel interests funneling me (and others) money under the table to produce certain research results and testimony, which have somehow mysteriously passed peer review and been accepted by the IPCC, or (b) there is no such conspiracy, but I (and others) need to be falsely accused and smeared in order to remove us from the debate. Tin foil hat or unethical campaigner? Not a great choice. Several reporters have asked me why I testify before Congress if I know that my results will be used by Republicans. Aside from the interesting framing of this question, I have written on my views of providing testimony here in PDF (following the testimony that I am now being investigated for) and please take careful note of the "To Avoid Any Confusion" bullets on p. 2 of my testimony here in PDF. This week I have been invited to do various interviews for print/online and radio. I'll update here when these are available and I have more details. 9 News in Denver had a excellent story, shown in the video above and online here. For those interested in my actual research on climate please head over to this summary in the final post at my climate blog, The Climate Fix. A group called the Energy & Environment Legal Group has filed state freedom of information act requests modeled on the Rep. Grijalva letter with 4 universities (Colorado, Arizona, Delaware, Georgia Tech) requesting funding information from 5 researchers. This is obviously a retaliatory act, legitimized by Rep. Grijalva's campaign. It is just as wrong-headed. Here in PDF is that strongly worded letter from the American Meteorological Society to Representative Raul Grijalva (D-AZ) warning that he is sending "a chilling message" to all researchers. Yesterday I had a nice chat with Representative Jared Polis (D-CO) who represents my district here in Boulder. What we said will stay between us, but it was very a positive conversation. Also yesterday @EricHolthaus - a widely read scientist and climate activist - taunted me with the following bizarre Tweet: "It’s getting harder and harder for @RogerPielkeJr to remain relevant." Upon later learning that I'm no longer doing climate change research Holthaus Tweeted that his earlier taunt was no longer relevant. Great evidence that a lot of this is about eliminating unwelcomed voices in the debate. At The Breakthrough Institute, Michael Shellenberger and Ted Nordhaus take the high road and argue that political intimidation of academics in unacceptable, defending both me and Michael Mann.